Freshman Blain Hanly pitches the Cruisers to victory over North Mason. Photo courtesy of Rina Springer. 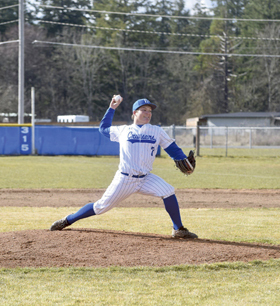 The Eatonville Cruiser baseball team took to the diamond on March 11 as they hosted the Spanaway Lake Sentinels on opening day of the 2019 season. Senior Andrew Wiklund started on the mound for the Cruisers where he sailed through the first inning by retiring all three batters he faced. Eatonville struck first in the bottom of the first when Zach Smith led off with a walk and Andrew Wiklund drove him in and the Cruisers would take a 1-0 lead. Wiklund cruised through the first three innings by not allowing a hit until Spanaway Lakes Dawsen Kaaiawela stepped to the plate and hit a 1-2 pitch hard into right field. He later scored in the inning as the Sentinels plated two in the inning to take the lead, 2-1. Spanaway Lake tacked on another run in the sixth inning off of Jarod Humphrey who came in to relieve Wiklund in the fifth. The Sentinels went on to take the 3-1 victory. Looking to bounce back from their opening day loss, the Cruisers hosted the North Mason Bulldogs on March 13. Freshman Blain Hanly got the call to start for the Cruisers on the mound. Hanly went five innings giving up only one hit, walking one and striking out three to pick up the win. The Cruisers got the scoring started in the third inning when Hanly flew out to the centerfielder and Brandon Storm tagged up and scored. They added one more run in the inning when Andrew Wiklund doubled to right field scoring Zach Smith. The Cruisers added one more run in the fifth when Jarod Humphrey hit a hard ground ball to the third baseman and reached on an error scoring Hanly to finish off the Cruiser scoring. Freshman Jacob Lucht came in to relieve Hanly in the sixth. Lucht worked the final two innings giving up only one hit while striking out one to pick up the save and preserve the Cruisers 3-0 victory. After hosting their first two games of the season, the Cruisers traveled to Spanaway to take on the Bethel Braves on March 14. Eatonville drew first blood after they would load the bases and Ryan Rogers single homed Zach Smith. They kept the scoring going when Josh Kondra drove in Blain Hanly. Ashton Meyer then drove in Andrew Wiklund from third to take a 3-0 lead. The Braves countered with three runs of their own in the bottom half of the inning. Both teams put another run across in the second inning to put the score at 4-4. With Jarod Humphrey in relief, Bethel pushed another run across in the fourth to take the lead, 5-4. With a runner on second, Zach Smith came in to relieve Humphrey and struck out the next two batters to end the inning. In the top of the sixth, Eatonville tied the game up at 5 after Zach Smith hit a sacrifice fly to center field and Jacob Lucht tagged up to score. Andrew Wiklund came in to relieve Zach Smith in the bottom of the sixth inning. He struck out the first two Braves batters he faced, before hitting a batter and walking the next. With two runners on, Bethel’s Wyatt Breshears pinch hit and drove a Wiklund 0-1 pitch over the right-field fence for a three-run home run to give Bethel the 8-5 lead. The Cruisers couldn’t answer back in the top of the seventh and fell 8-5 to the Braves. The Cruisers were scheduled to take on the Foss Falcons but the Falcons did not have enough eligible players to field a team, therefore the Cruisers would take the win via forfeit.